A: As you know, we live under occupation so people have to move and do something to end it. We have to protest and attend demonstrations anytime and anywhere. 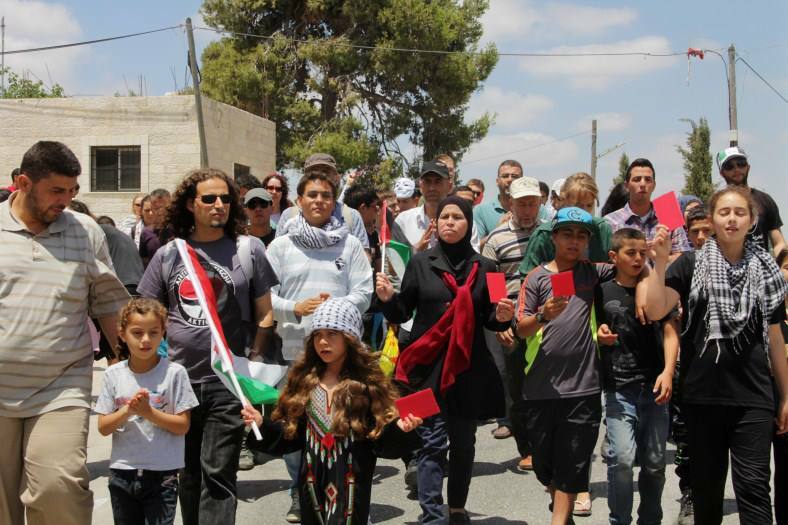 ISM: Nabi Saleh demonstration, for example, receives a lot of press coverage. What lesser known demonstrations do you cover and how are these different? M: Sometimes there are protests at Ofer during the night and no one knows anything about this. This is one of the unknown protests. Also at Qalandiya, there is no press, there are often no medics, only a few people there. I go sometimes to these clashes. A. is always there. A: Yes, I’m always there, at Ofer, Qalandiya. But no one knows about it. All the media is in Ni’lin, Bil’in, Nabi Saleh – the villages outside Ramallah. Those other places, nobody know about them, especially the media. However, I think the places where there is no media can be good for shabab (Palestinian youths) as they can do whatever they want for the resistance. M: But it is also good for the soldiers, they can also do whatever they want and no one will film them. A: This is the difference. But even if there is media, the Israeli soldiers can do whatever they want, no one can stop them, we know that. ISM: Do you think that the presence of internationals, such as ISMers, makes any difference at demonstrations in Palestine? M: Actually, there is difference between internationals and ISMers. Some internationals like to be here because they think they are going to liberate this country but they are actually doing nothing, they are just messing up the situation more and more. But some people, like ISMers, do something at least. They try to help in an organised way. But it depends, there are different internationals, some just come to see what is happening, some come to take photos, there are differences. It depends on which international we are talking about. A: I will say like him, in short way, there are people who come here just to take a photo, like if this was an adventure. They think there is adventure in the West Bank so they come. And there are people who come to support Palestinian cause and popular resistance. M: Some people think it is a game. A: Yes, they think there is adventure – they think “let’s go to see it, to try it”. ISM: There have been some deaths of paramedics. Do you think medics are deliberately targeted at demonstrations? M: There is a difference between us, medics who work in the field, and people who work in the ambulances. The Israeli forces target a lot of ambulances in Gaza and also the hospital there. But, yes, sometimes they do target us as well. Sometimes they just shoot directly. If there is no media, then they’re just going to do it. 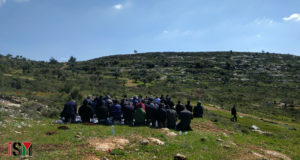 They did it at Ofer and also here at Nabi Saleh several times. One time he [pointing at A] got shot – they shot him directly with a tear gas canister. Directly at him. He ducked just in time, so he didn’t get shot in the head. A: They tried to kill me! M: Once they targeted me when I was with just a couple of other protesters before the demonstration – because there was no media, and it was before the protest had started they just shot directly at us. So yes, sometimes they do this, yeah. They don’t care. A: They think we are Palestinian so we have to die. They don’t care if we are medics or not. They target everything. M: Also at Qalandiya on Nakba Day, they [Israeli forces] started restricting the ambulances from the PMRC and the Red Crescent – they don’t want them to help the shabab (Palestinian youths) because if there are more ambulances, the shabab will just keep going, because they know someone will carry them and help them if they get shot. ISM: You told us about the Israeli army aiming at your head – could you tell us about your injuries? A: Yes, they called the driver and asked him “how is the medic? If you want to take him to hospital, you can go through the checkpoint – you can cross it.” But actually they wanted to arrest me. I didn’t go in the ambulance. M: A bit later, the ambulance took someone else and the soldiers stopped the ambulance for fifteen minutes – checking the ambulance. M: They also once shot directly at us just over there [pointing] but I went like this [dodging] – so it hit him! A: I am like a magnet. ISM: So this is despite the fact that you are wearing medics’ clothes and backpacks – you are easily identified as medics? M: Yes, it’s obvious that we are medics, so they shouldn’t be shooting us or targeting us, according to international humanitarian law. But they don’t care about this. ISM: So you spoke about the ambulance being stopped at the checkpoint and searched, obstructing medical care. In what ways has the Israeli army obstructed your work? M: Actually the thing with the ambulance has an explanation – they [the Israeli army] are allowed to check ambulances for fifteen minutes – no longer than that. Because in the second intifada there was a suicide bomber inside an ambulance and they stopped it at Jaba and the Israelis brought all the media and filmed it. So since that they are allowed to stop the ambulances and check them for fifteen minutes. That was part of the agreement. Once in Nabi Saleh they didn’t allow the ambulance to get in after a girl who got shot down the hill with a tear gas canister. For three hours we kept calling the Red Cross, the Red Crescent but nothing happened. 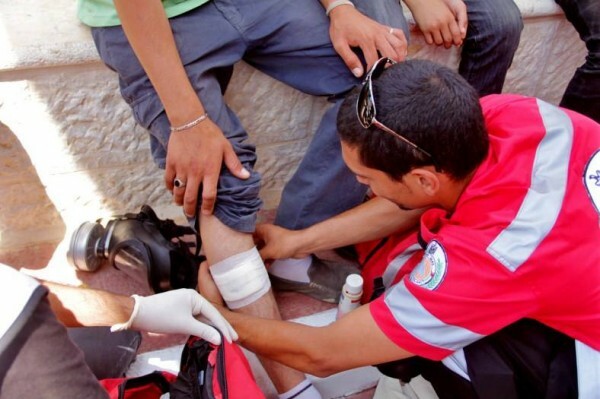 In the end they brought another ambulance from Nablus – so they came from the other direction. And there was a guy who got shot with a rubber coated steel bullet from a short distance, grazing the top of his head and leaving him with a three centimetre cut – but he was fine. They [the ambulance crew] told him, if we pick you up and take you to the hospital then they’re going to arrest you. So he decided to stay in Nabi Saleh. After that, when a guy got shot with a dum dum bullet – that’s the only time that they let the ambulance get out. We had to take the other two guys with a service [shared taxi] to Ramallah hospital. ISM: How many injuries do you usually treat at a demonstration, and what kind of injuries are they typically? A: That depends! If the soldiers are having a nice day, maybe they will shoot fifteen, sixteen. But if they’re angry, more than this number. Twenty, twenty-five. M: They use tear gas and rubber coated steel bullets – the worst is the rubber coated steel bullets, because they go randomly and hit many people. When they aim with live bullets they just shoot one guy, but when it’s rubber coated bullets, it’s spread over many. It also depends if you want to count the tear gas inhalation as an injury. 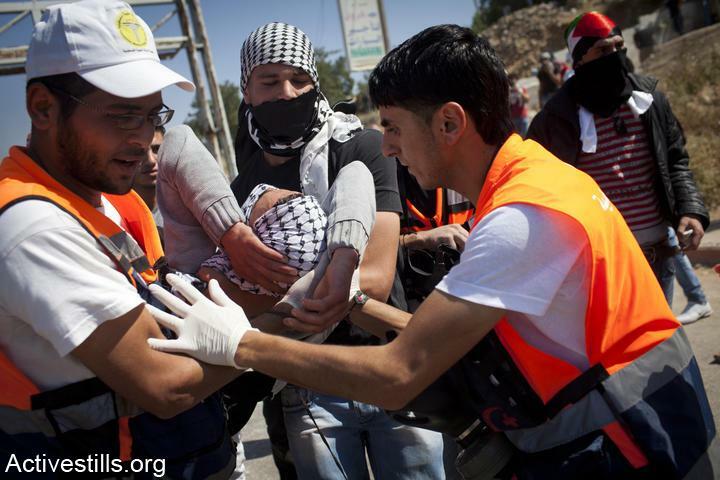 A: You can see, in Nabi Saleh there are maybe five or six injuries in the protest. Maybe more sometimes. But if you look at Ofer, eighteen, nineteen – even one hundred, sometimes even more. M: Usually they just use tear gas and rubber coated steel bullets. I think in Nabi Saleh there was just one guy who was shot with live ammunition. A: In Nabi Saleh, no, not just one. Three. One of them was shot on this mountain in his leg with a live bullet. Another in his hand. And Rushdi, who died last year, was shot in his leg on that mountain. ISM: Were there medics there when Rushdi was killed? M: No, we were not here, because they shot him on Saturday – it wasn’t a demonstration day. In the beginning they shot him with a rubber coated steel bullet so he couldn’t move, and then they shot him with live – just like that. A: When he was on the ground. The bullet passed through his leg and stopped in his back. He died after five days. M: In the beginning they didn’t allow him to be taken to hospital – they tried to arrest him. A: Yes, they tried to arrest him, they were pulling him. When he was shot there were three metres between him and the soldiers and he was on the ground. ISM: You were present at the demonstration when Mustafa Tamimi was killed – can you tell us a little bit about that? A: I don’t know what you want exactly…I saw him when he died. Before he got shot, I was on the mountain – a bulldozer was brought into the village, so all the shabab chased the bulldozer and threw stones. The jeep turned around down there [pointing to the road into the village] and came back. There was Mustafa and someone else close to the jeep, throwing stones – they were like four metres away. Then the soldier in the jeep got an order from his commander that said “shoot him.” So he shot directly into his [Mustafa’s] face. The canister went inside his face like five centimetres – so when I went to him and looked at him, I told everyone nearby “he has died. We can’t do anything for him.” We carried him and put him in a service and sent him to the soldiers at the checkpoint. The commander said “he is fine, but we’ll take him to the hospital now”. But then they kept him like half an hour at the checkpoint, on the ground – they took him out of the service and put him on the ground – after that they took him with a military ambulance to a village further down and then took him in a helicopter to a hospital in forty-eight, near Tel Aviv. They [the Israeli authorities] did that just to stop people reacting – because if they know he is dead, something bad will happen. I think, if the people had known then they would have continued demonstrating and there would have been more people dead after Mustafa. But the soldiers came back and said, “he is okay, don’t worry”. They gave his family and other people from the village permits to go to the hospital to visit him. They never give these to anyone, but they gave five permits to Nabi Saleh that day. They just wanted the people to calm down that day. The next day, they said he was dead and sent him to Ramallah hospital.